Foldable Saw (blade length: 17 cm) to remove big branches or roots. Suitable for wet and dry wood. Foldable Saw (blade length: 21 cm) to remove big branches or roots. Artificial leather bag for up to 5 scissors or pliers. Artificial leather bag for up to 7 scissors or pliers. 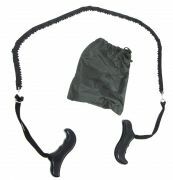 Clothes bag for up to 10 scissors or pliers. 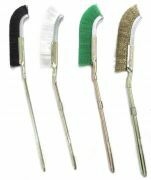 Brush made of Coconut fibres. Helpfull to clean the surface after repotting or spreading akadame granules on the soil-surface. Also you can use it to brush dry leafs etc away. Please choose product... Bonsai Brush (120 mm) - 6,- EUR Bonsai Brush (150 mm) - 8,50 EUR - SOLD OUT ! Height fully adjustable from 43 to 60 cm. Height fully adjustable from 47 to 82 cm. Japanese Stainless steel spatula and tweezers in one convenient tool. Special tweezers for a strong hold. Thereby good for work on pines. Used to form/bend thicker branches. Made in Japan. With this tool you can bend hard branches easily. The part the branch comes in is covered with plastic. Made in Japan. 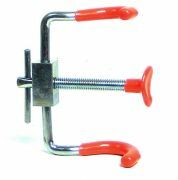 These special clamps are made to bend thick and hard branches like you want them. Foldable Saw (blade length: 11 cm) to remove big branches or roots. Foldable Saw (blade length: 150 mm) to remove big branches or roots. Blade made ? ?of high quality hardened tool steel. Teeth grinding and extra hardened. This saw has a fixed blade and a robust wood handle. Useful helper while working on raw material. Very fine blade for precise work. This saw has a fixed blade and a robust sheath. 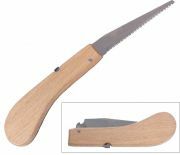 Folding Saw, especially for large stems. With sturdy handles made of plastic. 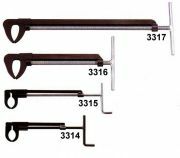 Detachable hacksaw, easy to store and quickly assembled. 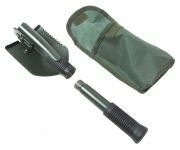 Small handy outdoor spades, folding, with pick and shovel blade with serrated, rubber handle, spade. Incl. Plastic case with belt loop. Yamadori-Tool: The original folding shovel of the German Army (Bundeswehr) with plastic holder for wearing it on your belt. Useful for loosen the ground and getting stones away. This folding, handy shovel is ideal for traveling. Extremely light and strong, with pocket (belt loop). Metal handle with attachable saw, pick and shovel, convenient snap. Excellent to to pick up sheets of dense branches out. The flat end can be made after transplanting fine work on the earth's surface, Moose place etc. Masakuni Tweezers with bended nose and small bended end. Ideal for get individual leaves out of the crown. Masakuni Tweezers with blades made of steel. Ideal to tweeze Maples and to cut off leaves on hard-reachable areas in dense crowns etc. High-quality saw, specially designed to use in narrow places. Especially made for the high quality Masakuni tools (Japan). Please use oil while sharpening. High quality oil for Masakuni sharpening stones.